A prequel to the best selling Luchettis Series. Max Frasier is a remarkable eight-year-old boy whose imagination and clumsy feet get him in trouble. Max doesn't mean to forget he's grounded when he wanders off to follow the wind or a whim, he just forgets. Max is fascinated with things that go bump in the night and in Savannah, Georgia there are a lot of them. Livy doesn't have a clue how to cultivate the magic that lies within her child. By trying to keep him safe from broken bones, she crushes his flights of imagination. In trying to make him like other little boys, she fights against what makes him special. When Max meets Garrett Stark, famous horror author, he finds a kindred spirit. What he doesn't know is that he's found his father. 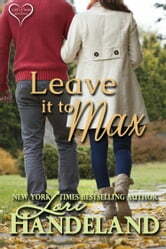 Livy was the first person to offer Garrett love, and uncertain how to love back, believing himself unworthy, he had run. But from the first moment Garret sees Max, he knows there's something special about the child. Garrett had thought he'd returned to Savannah to pursue the muse that inspired his previous books. Now he knows he's come back for Livy. Can the three of them get past the lies between them to make a family and a home?